At Industrial Motions Engineering, we are committed to your success. 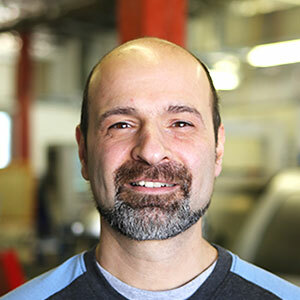 Owner Joe Fustolo holds a degree in electro-mechanical engineering. He has over 30 years of machining experience. His extensive knowledge brings together two sides of the prototyping process, engineering and manufacturing. The benefit of this approach: Designs that are more feasible, cost effective and quicker to implement than those made the conventional way. At Industrial Motions Engineering, we do everything under one roof, allowing us in many cases to design and build in just one day. Whether it's a simple part or a complex part with close tolerances, one piece to a large production run, we give each job the same level of attention to detail. The result is quality and precision every time. IME is a no hassle, professional shop that consistently gets my first RFQ because of their commitment to quality and delivery. They are flexible and resourceful making life a lot easier for engineers on a tight delivery schedule. Over the past 13 years or so, I’ve called upon the staff of Industrial Motions to help us out on a variety of projects, as have numerous other engineers with our company. These projects have involved a wide and unique range of fabrications & assemblies uncharacteristic of most machine shops. Their skill and creativity responding to our needs, many times on short notice, makes them one of the “go-to” shops for our company. Mike Amaral, Design Engineer of QinetiQ North America (Foster-Miller Inc.) Waltham, Mass. IME has been a key resource for our company since the first project we worked on with them. They are fast, agile, and excellent to work with, and their engineering expertise sets them apart from other partners. Rather than just produce parts and assemblies, they can be an entire one stop solution for new product development and short to medium manufacturing runs. We highly recommend them! Joe completed his degree at Wentworth Technology and knew he wanted to start an engineering firm after he graduated. He started the business with two rented Bridgeport milling machines occupying a small space at his father’s machine shop. Since then he has expanded the business, acquired numerous pieces of CNC equipment and purchased a facility in Wilmington, MA where Industrial Motions currently operates. Joe has a degree in Electromechanical Engineering from Wentworth Technology, 1998. He has had machine shop experience since he was very young as his father owns and operates a machine shop. His outside interests include his family – watching his oldest daughter compete on the swim team and his youngest sing, play and dance, home construction and renovation, and listening to music. Alana is responsible the daily operations and customer experience at IME. If you need a quote, would like to place an order or check the status of your order, she’s happy to help! 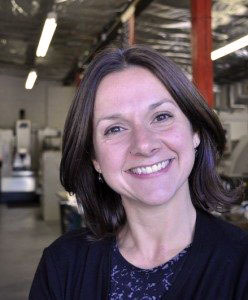 Alana has 20 years experience in the manufacturing industry. Outside of work, Alana enjoys spending time with her family and cooking. The team at Industrial Motions Engineering is dedicated to your success! Utilizing our knowledge, communication and flexibility, we strive to exceed the expectations of our clients with carefully engineered and meticulously manufactured products.